Cranes are incredibly efficient pieces of equipment when it comes to lifting heavy loads, but they can create a serious safety issue if misused. 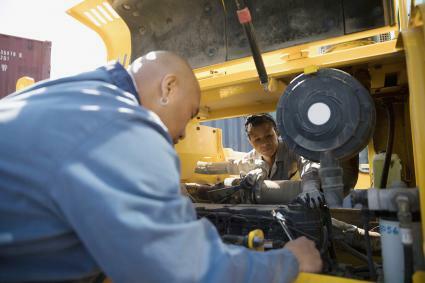 Following basic safety instructions can help keep the operators, bystanders, and the equipment unharmed and undamaged. Butch Kuykendall, a National Commission for the Certification of Crane Operators (NCCCO) certified bellman and rigger for the International Union of Operating Engineers (IUOE) local 302 said, "The most important safety tip is to make sure there are no power lines in the area that you plan on hoisting and operating in." Kuykendall explained further, "Make sure you have plenty of space between the area that you plan on working on and the power line." He referred to this as the "isolation barrier." Kuykendall said the most common mistake is, "... improper inspection of all rigging and improper inspection of the loads that you are hoisting." Make sure these inspections are performed properly to ensure safety. Screen crane operators to ensure their experience is up to par. Utilize a certified crane operator when the crane is in use. Communicate with those that will be near the crane before, during and after a lift to ensure everyone's safety. Before lifting, come up with a plan for those who will be impacted by the lift. Operate the crane on good footing, as instability can lead to serious injuries and damage. If you have any questions or feel unsure about a lift, delay the task and ask someone with more experience to assist you. Stay up to date with the latest crane safety rules and conduct employee safety seminars on a regular basis. Ensure that crane operators are taking breaks, are well rested and are alert during crane use. Keep the crane well lubricated. An annual crane inspection should be carried out by a certified professional prior to using the crane and after the crane has been used. Keep records of crane inspections. Check the crane daily for damage prior to using. Only use the crane for its intended purpose and know your particular crane's limits. Never store anything on the crane. Fix issues with the crane right away and notify crane operators to hold off on using the crane until further notice. Taking good care of your crane can save you time and money. Maintain your crane based on the manual that accompanied it during purchase. This may require a twice a year inspection, or a daily inspection depending on its use, and how frequently it is operated. Be mindful of operating the crane in harsh weather as it can impact the ground stability as well as the ability of the crane to do its job in a safe manner. If you are operating a crane or work on a construction site where a crane is being used, be sure to follow your company's basic safety tips, as well as OSHA's recommendations. Being mindful of a few simple rules can help prevent serious crane related injuries and deaths.